One month ago, on July 24, 2015, the sixth and final Messner Mountain Museum opened to the public on the top of a mountain in northern Italy, a couple hours from where I live. This newest museum is a futuristic design by an Iraqi architect, and is the brainchild and property of famed mountaineer Reinhold Messner, who comes from the Italian region of Alto-Adige. In this post I will give a brief summary of the almost unbelievably interesting life of this living legend, and give some thoughts on how he fits philosopher Friedrich Nietzsche’s concept of the “Übermensch” (“Superman”, or “Overman” as it is commonly referred by scholars to avoid association with the cape-wearing superhero). 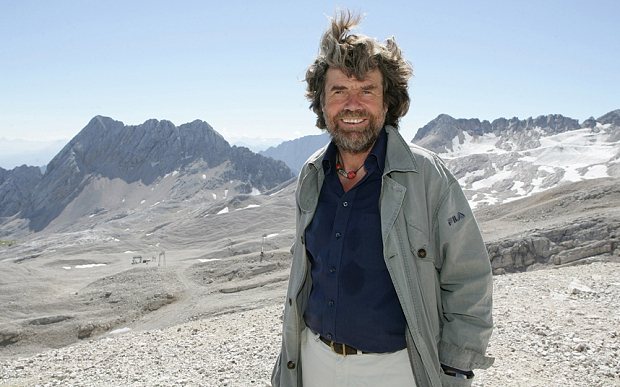 Messner was born in 1944 in the Italian German-speaking town of Brixen surrounded by the Dolomite mountains. He was the oldest of nine brothers and one sister. From an early age, he and the second oldest brother, Günther, had a passion for climbing and would escape from church and school to climb the stone walls around the village. By their early twenties, Reinhold and Günther were among the best climbers in Europe in the relatively new style of free climbing, and had put together an impressive resume of climbs in the Alps. In 1970, they were invited to a Himalayan expedition to climb the 8000-meter Nanga Parbat. Trying to beat the bad weather forecast, Reinhold left camp alone to make the peak’s summit, followed secretly by Günther. They both reached the top, climbing the tallest continuous rock face in the world (which is still unrepeated today), but got lost in a storm on the descent and took an alternate traverse route down the other side (which is also unrepeated). After four days without food in -40C temperatures, they became separated and Günther lost to an avalanche while Reinhold crawled and limped his way to a village, where he was carried to safety. He had severe frostbite and seven toes were amputated. The psychological scars have haunted Reinhold ever since (it was only in 2005 that some of Gunther’s body was found and recovered), and the physical damage of frostbite forced him to change his climbing style and focus more on high mountaineering rather than free climbing. The events of this perilous expedition were told in a 2010 German movie entitled Nanga Parbat. After 1970, Messner began compiling amazing feats of mountain climbing and pushing the limits of what was considered physically possible. Over the next 35 years or so he would go on annual expeditions to every corner of the planet with the highest mountains, coldest temperatures, and most extreme conditions. In 1978 he, along with his partner Peter Habeler, became the first to climb Mt. Everest without the use of supplemental oxygen, which was long thought to be impossible. Many people did not believe that they had actually achieved this feat, so two years later, in 1980, Messner climbed Everest again without oxygen by another more difficult route, and was the first person to climb the mountain alone (previously thought to be a suicidal endeavor). Already by 1975 he became the first person to have climbed three of the 8000-meter mountains. In 1986 with his ascent of Lhotse, he became the first person to climb all 14 8000-meter peaks, all done without supplemental oxygen. Today, only 15 people have accomplished this feat. In 1979 on K2, the most fatal peak in the world, Messner led a team that featured Renato Casarotto, an Italian who hailed from my adopted home of Vicenza. In 1984, along with Hans Kammerlander, Messner climbed two 8000-meter peaks consecutively without returning to base camp–Gasherbrum I and II. Out of the dozens of ascents and attempted ascents in the Himalayas, Messner put up many new routes that had never been done before, made the first winter ascent of several peaks, and survived many huge high-mountain storms and illnesses. 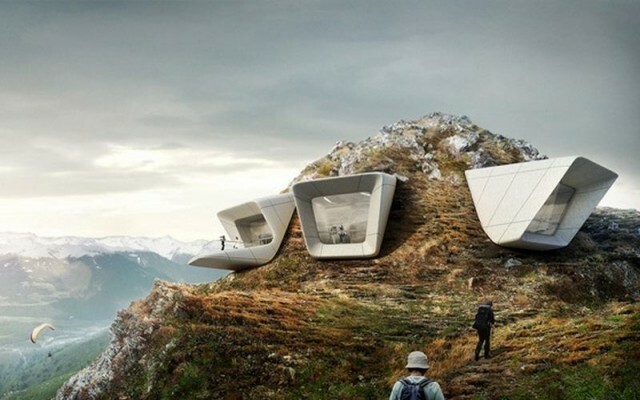 The newest Messner Mountain Museum “Corones”, built into the peak of the mountain. The list of things done by Messner even outside of Himalayan and Karakorum alpinism is too long to tell. Here are some highlights. In 1986 he became the second person to complete the “Messner list” of the highest mountain on each continent (and first person to not use oxygen). In 1974 he set a speed record for the Eiger North Face of 10 hours, which stood for 34 years. He established new routes on Denali, Kilimanjaro, Aconcagua, and at least 100 other mountains around the world. He led rescue expeditions and mountain cleaning expeditions on multiple continents. He did a solo expedition in 1988 beginning a 12-year search for the mythical Yeti that he had seen several times (spoiler: he concluded that they are some type of nocturnal bear; his critics thought he had become a crackpot whose brain had been deprived of too much oxygen, but an independent Japanese study later confirmed the rare Himalayan bear). In 1989, he, along with Arved Fuchs, became the first person to cross Antarctica over the South Pole on foot with only human power — a 2800-kilometer journey. In 1993 he also crossed the length of Greenland on foot — a 2200-kilometer journey, and in 2004 he did a 2000-kilometer crossing of the Gobi Desert on foot. He has written or contributed to over 60 books about his various expeditions, and eventually became personally wealthy from his sponsorships, speaking fees, and book sales. His primary summer residence since 1983 has been the 13th century Juval Castle in apple-growing Val Venosta near the borders of Austria and Switzerland, which is now one of his six museums. From 1999-2004 he was an elected Member of the European Parliament with the Green Party. Since 2004 or so, he has mostly been retired from climbing and adventure and spends his time planning and managing the Messner Mountain Museums. He speaks fluent Italian, German, and English, and is an interesting and entertaining speaker on any subject as a quick Youtube search will attest. 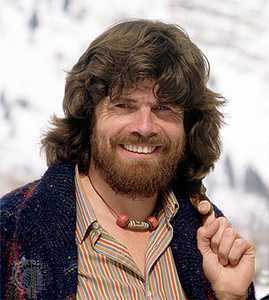 Messner is famous for his fierce advocacy of “Alpine-style” climbing, rather than the traditional “expedition style” which he referred to as “siege tactics”. His goal was to climb a mountain quickly with a light load using speed and skill of individual climbers rather than teams of dozens of porters and base camps crawling up the mountains and relying on set ropes and pre-location of stores. This style has since become the only respectable method of high mountaineering. He is also deeply concerned with environmental issues and conservation, especially in the mountainous areas of the world. He is an advocate for Tibetan independence, and has great respect and concern for the cultures of traditional peoples around the world he has encountered throughout his life. One of his museums, in Bruneck Castle, is dedicated to the cultures of mountain peoples around the world. Is Messner a Nietzschean Übermensch? Nietzsche is one of those philosophers who are still controversial amongst other philosophers, and is only known by a couple famous phrases to most of the public. His works are aphoristic and open to a variety of interpretations. People associate him with the Nazi regime because they used his ideas for their own purposes, even though he hated Germany, nationalism, and authority. I have commented on Nietzsche at further length in a previous post (Bertrand Russell on Nietzsche), but after additional reflection and perspective my views towards Nietzsche are more open now than before. I think that like almost anyone who had many ideas, some of them are useful, some of them not so much; that is my feeling about Nietzsche. Regardless, I think his is a personal, not a political, philosophy, and should be used for personal development rather than for social or political change. Messner has stated that his favorite philosopher is Milarepa, an 11th century Tibetan master who climbed mountains and eventually flew away. Messner also quotes directly or indirectly in his books and interviews from Nietzsche, whom he obviously admires. Like Nietzsche, Messner is a controversial figure, mostly due to his enormous ego and inability to take criticism. As all of Messner’s peers attest, however, he has walked the walk and someone of his stature has the right to make his own rules and act his own way. Messner shares traits with people who are considered the best in their field, be it sport or the arts or business; unlike most every other field, though, extreme mountain climbing carries high risk of death on every expedition. Anyone who has spent time doing serious mountaineering, rock climbing, or any extreme cold weather activity knows that no words can describe the feeling of a timeless present pushing forward against the force of nature, brain emptied of all worries except survival. This is why there is nothing else like it. Messner is a larger than life personality with unreal achievements, a living tour de force who redefines the limits of human potential not only in sport but in any activity. I will end with a few select quotes by Messner and then by Nietzsche, and you can ponder and perhaps take some useful example for your own life, some boundaries to push or challenge to undertake.